Two things have started me off on a journey alongside Lord Peter Wimsey and his investigations: I read a wonderful academic book about literary and fashionable styles, which focused on Sayers among other female writers, and I came across a paperback set of nearly the entire Sayers oeuvre in a thrift shop. I've begun at the beginning and gone on from there. The first book to feature Lord Peter Wimsey is this one, Whose Body?, published in 1923. It seems odd that it's so early as I've always associated this series with the 30s. But this novel is both a great read and an engaging introduction to this sleuth. Lord Peter investigates a naked body found dead in a tub - not so unusual except that it is a stranger is someone else's tub. How did it get there? And what is the reason for some of its more unusual characteristics? Through the investigation, we get to know Lord Peter and his man, Bunter -- their habits, skills, characters, and their pasts. We learn, for example, that Lord Peter still suffers from PTSD, like many of the former soldiers in Sayers' stories. He may look a bit silly, and sometimes sound that way too, but he's clever and serious beneath it. And what's more, he's a gentleman. Always courteous even when involved in murder investigations, polite and genteel even when curiously digging into private matters, fastidious about doing the right thing; Lord Peter is very appealing. This mystery is puzzling, too -- with more than one missing person, a bit of money at the back of things, and something often found in these books... the respectable person who is worse than anything in his secret life. 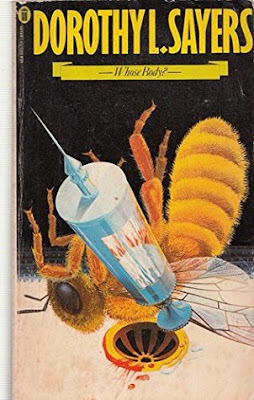 Sayers really used modern medicine and science in this book; one of the reasons I like mysteries so much is that they reflect the daily life in which they're set, and this one brings in a lot of daily life. There is even evidence of the anti-semitism that existed in British society at this time (and has it ever really gone away?). In this one, though the victim turns out to be Jewish and there are some comments about that, the orphaned daughter is also love interest to one of Lord Peter's aristocratic friends. There is some complexity to the story. I enjoyed this novel, and whizzed through it. I've been ill over the past week or so and mysteries are great reading for days spent in bed. I've got through many of them and will be sharing more over the next while! Have you read any Wimsey? Or have you watched any of the BBC productions? The Edward Petherbridge/Harriet Walters versions are the only ones worth watching, in my opinion. But the books are definitely superior. I do love these books. I haven't read all of them yet, but the ones I've read were wonderful. I am new to the Petherbridge/Walters version. I've just seen one or two. But I must admit I loved the Ian Carmichael versions. Those shows were magic to my husband and I. I now own the DVDS, and I might buy the P/W ones, as well. Maybe I will have myself a little marathon of books and televised versions in the future. What fun! I'm so happy people are still reading and writing about the books. But I'll try again. I just love these books! I was introduced to Lord Peter through the BBC production of Clouds of Witness. I immediately found the books and never went back to the TV version. Lord Peter was my first real literary love, and I gradually came to appreciate Helen :) But I also fell in love with the Dowager when I first met her, she's a peach! Ack, not Helen - Harriet of course! Harriet is quite lovely isn't she? I thought you must mean her... I never warmed to Helen, just the Dowager Duchess. I first read these books back in my teens and I still have them on my shelves. They never disappointed on a revisit. Carmichael is the perfect Wimsey for me - I just wish the BBC had let him make all the stories! Yes, wish there was a complete run of all of the stories too! So glad you enjoy them as well.